petition: Reduce Plastic Straw Waste in California! Reduce Plastic Straw Waste in California! We all know plastic pollution is a serious problem, and plastic straws are no exception. These single-use conveniences are literally trashing the planet. There's not a beach around the globe that is free of this pollution. Our creeks, rivers, lakes and oceans are all fouled. 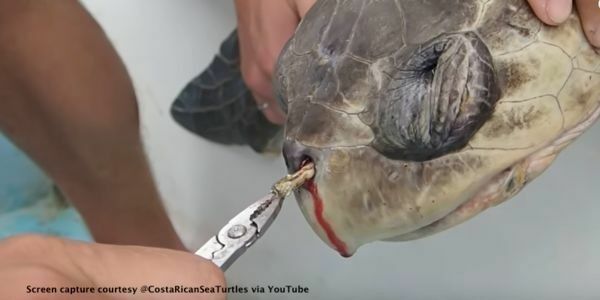 Wildlife, such as the sea turtle, can confuse straws for food and cause themselves great harm. That's why Ian Calderon, the majority leader of the California State Assembly, has introduced a new bill to reduce plastic straw waste. Please sign this petition to show your support for this bill. Two California cities already have "straws-upon-request" bills, barring restaurant workers from providing straws unless a patron asks for one. Calderon intends for his bill to do the same statewide. While the bill's language currently imposes jail time and a heavy fine for servers who break the law due to a clerical error, Calderon has promised that the unnecessarily harsh penalties will be taken out if the law passes. According to Calderon, the bill is not meant to be an outright ban on straws, but is meant to help reduce waste and draw attention to the severity of the problem -- a noble effort considering the fact that the United States alone uses over 500 million straws every day. Stretched end to end, they could circle the globe 2 & 1/2 times. Please show your support for the environment by signing this petition asking the California State Assembly to pass a statewide "straws-upon-request" bill as long as it does not impose jail time or an overly burdensome fine.